3 or 4 Fresh Brook Trout6 fresh mushrooms, sliced2 med. onions, chopped1/4 c. chopped parsleybutter1 1/2 c. italian bread crumbsPinch of sage1/4 tsp. onion powder1/4 tsp. garlic salt1/4 tsp. celery saltFresh ground pepperWash trout in cold water, pat dry. Saute mushrooms, onions and parsley in 4 tablespoons butter until onions are soft. Toss onion mixture with bread crumbs. Add sage, onion salt, garlic salt, celery salt and pepper to taste. Stuff trout cavities and place in buttered baking pan. 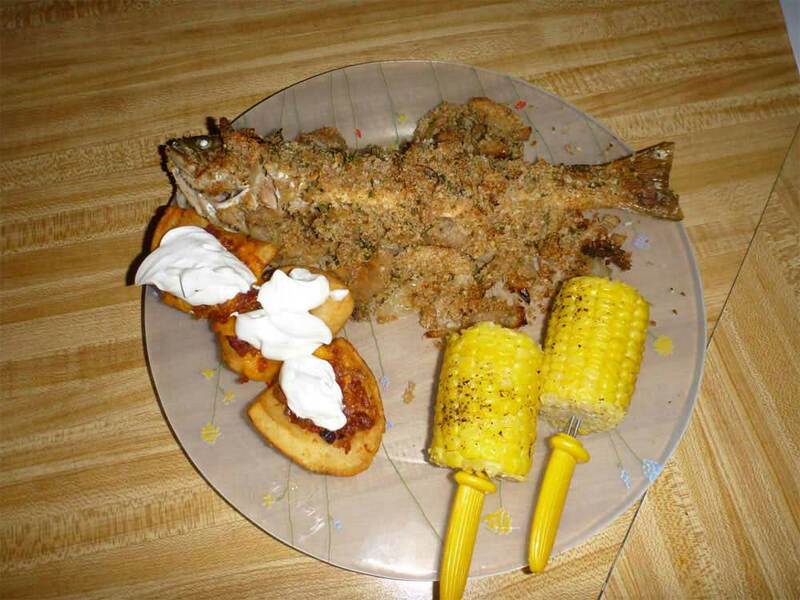 Brush trout with butter. Place any extra stuffing on fish in the baking dish. Bake at 400 degrees for 25-35 minutes. Serve hot.